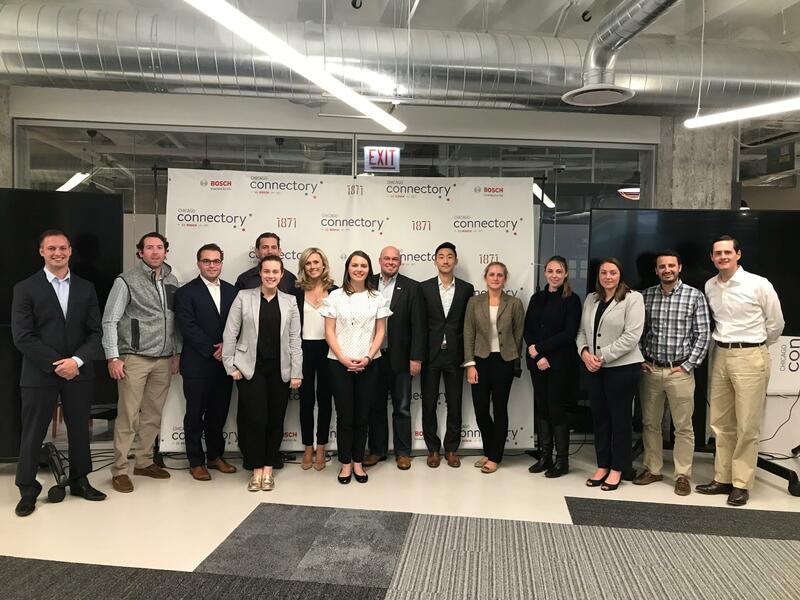 On Oct. 10 and 11, the Chicago Connectory hosted an IoT training facilitated by Kevin McQuown, the founder and principal engineer at Windy City Lab. The training was integrated with a challenge that Bosch proposed earlier in the week. MBA students from University of Notre Dame’s Mendoza College of Business were challenged to conduct research and present a market entry analysis and strategy for Bosch IoT solutions provided by the Bosch IoT Ecosystem Project. With only four days, the 17 students broke into four groups and conducted market research on Bosch, its competitors and IoT challenges in the market. Then, they created proposals, such as partnership programs with developers, partnerships with other companies and more. “All students did very well. By the end of the class they were doing a mood/status dial that can be controlled by an app and also a motion detective with push notification to their phone,” said Kevin McQuown. The final presentation was held on Thursday afternoon and was presented to Bosch and Chicago Connectory representatives. Chicago Connectory members were encouraged to watch the presentations as well. Watch the livestream from the event in HERE.